(CNN) -- Ireland coach Declan Kidney keeps faith with the players who have propelled his side to the top of the Six Nations table for Saturday's encounter with England at Croke Park, Dublin. 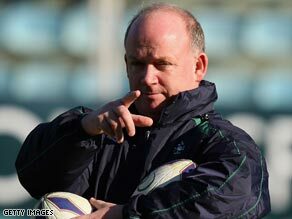 Ireland coach Kidney warns that his side face an improving England in their weekend Six Nations clash. The Irish are on course for a first Championship crown since 1985 following wins over France and Italy and Kidney has named the same side for a third successive match. Paddy Wallace, who needed stitches to an eye injury suffered against the Italians, has again held off the challenge of Gordon D'Arcy at inside centre. The only change comes on the bench where Mick O'Driscoll of Munster replaces Leinster's Malcolm O'Kelly and Kidney says fierce competition for places is stoking his side's title charge. "There are lots of guys I'd love to play, good players who aren't getting a chance to play. That's the making of a good side," he said. "The players in the side know that if there's any relaxation at all there are guys ready to take their place. "In terms of developing the squad work has been done on that behind the scenes. Talk about competition for places is not just lip service. "Pressure is being applied from beneath and if you're worried about your place in the team then it spurs you on to play better." Ireland have an impressive record against England, winning four of their last five meetings since losing the Grand Slam decider in 2003. England's performances this year do not suggest that is about to change, but the Ireland coach is taking nothing for granted. "England's performance in the last match against the Welsh was well up on the week before," said Kidney. "If they made that much of an improvement in one week in between Italy and Wales, who knows what kind of improvements they've made in the past two weeks?" Replacements: R Best (Ulster), T Court (Ulster), M O'Driscoll (Munster), D Leamy (Munster), P Stringer (Munster), G D'Arcy (Leinster), G Murphy (Leicester). Euan Murray returns to the Scotland front row for Saturday's clash with Italy after the Northampton prop missed the opening two matches against Wales and France with a rib injury. There is also a recall for Glasgow captain Alastair Kellock, who will make his first Test start for two years after Edinburgh lock Jim Hamilton suffered a shoulder injury. Murray and Kellock are the only two changes from the side beaten 22-13 in France just over a week ago, Scotland's second straight defeat in this season's tournament. Alasdair Dickinson, who started at tighthead in Paris, drops to the bench, replacing fellow prop Moray Low. Scotland: H Southwell (Edinburgh); S Danielli (Ulster), M Evans (Glasgow), G Morrison (Glasgow), T Evans (Glasgow); P Godman (Edinburgh), M Blair (Edinburgh, capt); A Jacobsen (Edinburgh), R Ford (Edinburgh), E Murray (Northampton), J White (Sale), A Kellock (Glasgow), A Strockosch (Gloucester), J Barclay (Glasgow), S Taylor (Stade Francais). Replacements: D Hall (Glasgow), A Dickinson (Gloucester), K Brown (Glasgow), S Gray (Northampton), C Cusiter (Perpignan), C Paterson (Edinburgh), N De Luca (Edinburgh).